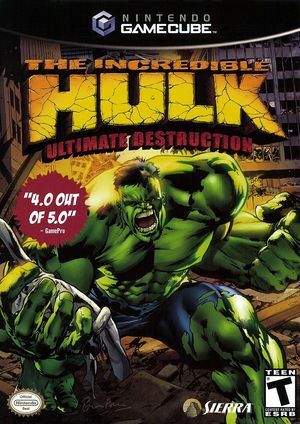 The Incredible Hulk: Ultimate Destruction is the second Incredible Hulk game released for the GameCube. Developed by Radical Entertainment, it built on the free-roaming aspect of Simpsons Hit & Run and allowed Hulk to freely explore and destroy both a full sized city and an expansive desert location. A key feature of the game is Hulk's ability to "weaponize" virtually any item in the game. For example, it is possible to rip a car in half and turn it into a pair of gauntlets, surf on top of a city bus, rip the missiles out of a launcher to hurl them at enemies, hammer throw the turret off of a tank, grab a plane out of the sky and beat enemies with it, hurl trees like javelins, and whack humans into the sunset with lamp posts. The Incredible Hulk: Ultimate Destruction has a native 16:9 display option, but it requires enabling it in its internal options and setting Dolphin's Aspect Ratio graphics setting to "Auto". Using the widescreen hack with this title is not recommended. Stuttering echo during in-game cutscenes. Audio does not sync up with video or subtitles. Corrected prior to 5.0-6309. The graph below charts the compatibility with The Incredible Hulk: Ultimate Destruction since Dolphin's 2.0 release, listing revisions only where a compatibility change occurred. This page was last edited on 11 April 2019, at 07:04.